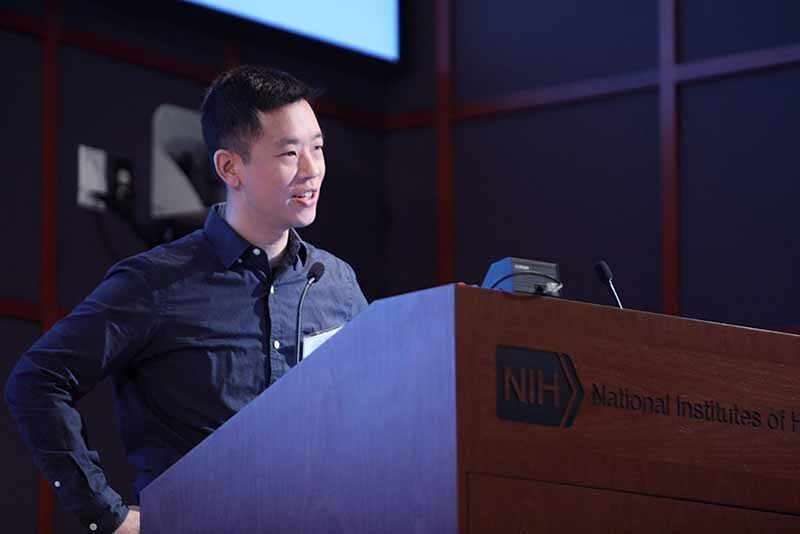 Now in its fifth year, “Science Day at NIH” was once again celebrated with pep rallies, speakers, and hands on activities—all celebrating science and health careers. 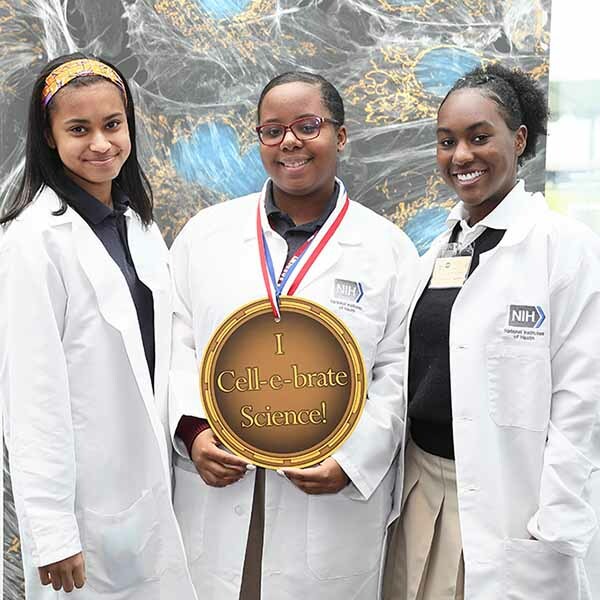 Nearly 500 students from 11 DC-area middle and high schools attended the event on the National Institutes of Health campus in Bethesda, Maryland, in May where they were presented with a wide array of science and health care activities and career options. Co-sponsored by the National Institute on Minority Health and Health Disparities (NIMHD), the National Library of Medicine (NLM), the Friends of the NLM, and the nonprofit Mentoring in Medicine, Science Day at NIH seeks to promote diversity in the biomedical workforce. The overarching goal of the event is to inspire students to explore careers in health care and science. 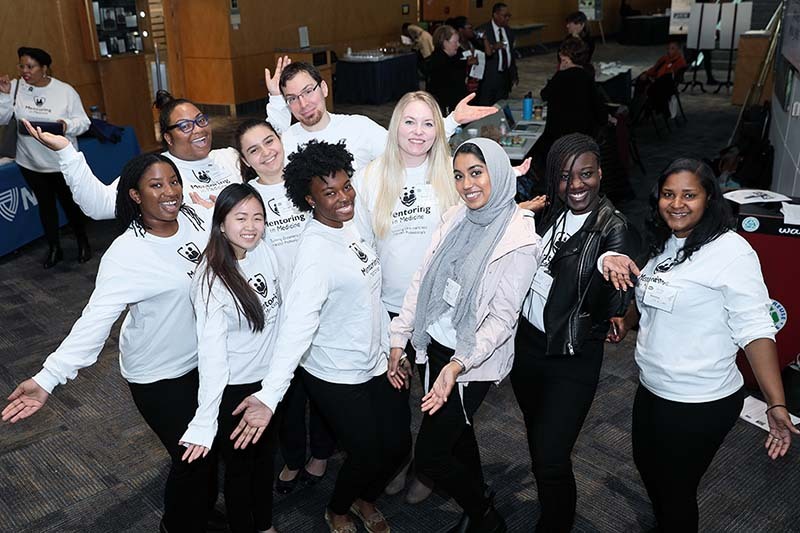 The students—many of them African American or Latino—participated in hands-on activities and presentations about biomedical research career options from a diverse group of scientists and other NIH staff. After a high-energy pep rally for science, students heard remarks by NLM Director Dr. Patricia Flatley Brennan (via video); NLM Deputy Director Jerry Sheehan; NIMHD Director Dr. Eliseo J. Pérez-Stable; and NIH Chief Officer for Scientific Workforce Diversity Dr. Hannah Valantine. Dr. Jeff Day describes how he applies his medical degree to creating cartoons and videos about medical topics. “This is a great opportunity for all of us here at the National Institutes of Health to welcome you and showcase what we do to contribute to the health of society, through biomedical discoveries, through creating new drugs and therapeutics, and through finding new pathways to help people better understand their health and health care,” Brennan told the students. She reminded them that, although they may envision themselves “wearing white,” as a health professional like a doctor, nurse, physical therapist, or pharmacist, there are many other ways to have important, satisfying careers in medicine. Trained as a nurse herself, the NLM Director earned a PhD in industrial engineering. “You have to have passion for what you do…If you dislike what you’re doing, you will not do a good job,” said Pérez-Stable, as he delighted the audience with a colorful journey through his medical and scientific career. He was born in Havana, Cuba, immigrated to the United States when he was eight years old, and did not learn English until the fourth grade. He pushed himself and ultimately reached great success. Panelists Dr. Kelvin Choi of NIMHD, Dr. Nakela Cook of the National Heart, Lung and Blood Institute (NHLBI), Dr. Jeff Day of NLM, and Dr. Carla Easter of the National Human Genome Research Institute (NHGRI) presented an overview of their respective roles at NIH and how passion helped them chart their career paths. During the afternoon, students were engaged through “Lunch with a Scientist,” where energetic staff of various careers—including a librarian, researcher, legislative liaison, information specialist, chemist, program officer, educator, digital asset developer, program director, public health expert, and psychologist—shared their roles at NIH. 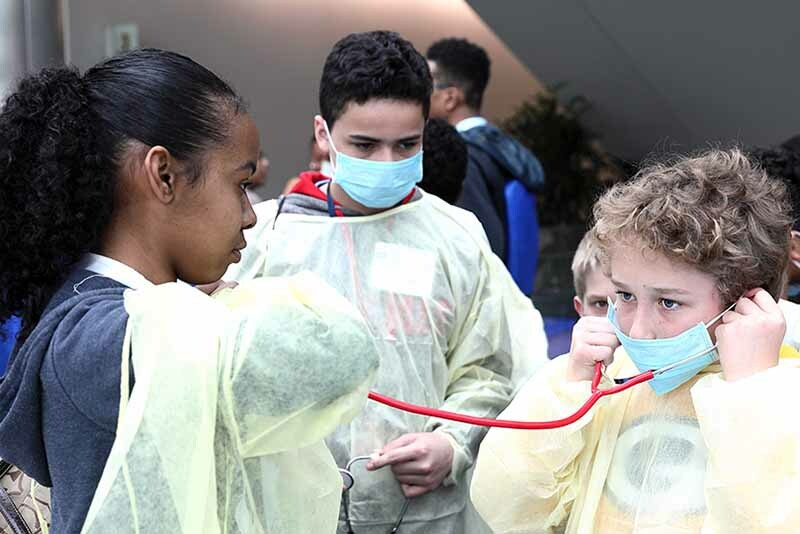 Activities at NIH Science Day included using a stethoscope to listen to heart sounds. Students visited an assortment of nearly 20 activity tables hosted by various NIH Institutes and Centers. These featured medical illustration, how to suture a wound, CPR, radiation safety, and headache-related games, among other activities. Exhibitors piqued the interests of many attendees with these hands-on demonstrations. 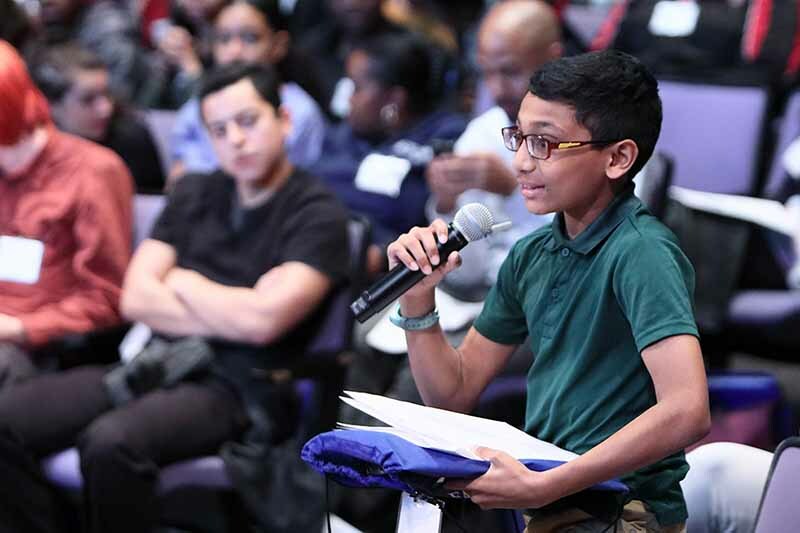 At the program’s end, students shared what they learned and asked a final round of questions. They also shared their appreciation to the NIH staff for fueling their passion, preparing them to choose a career, and providing an overall great day of learning at NIH. Many of the students also expressed their desire to return next year. 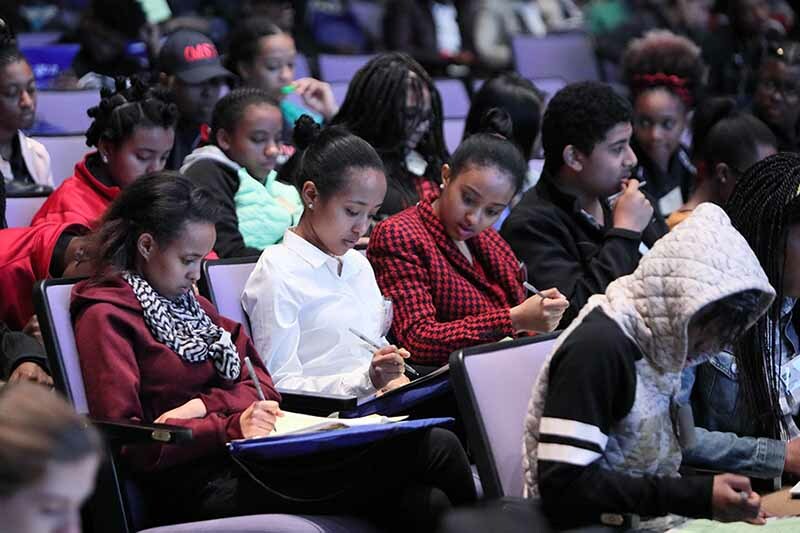 Students from DC-area schools learn about careers in medicine at NIH Science Day. 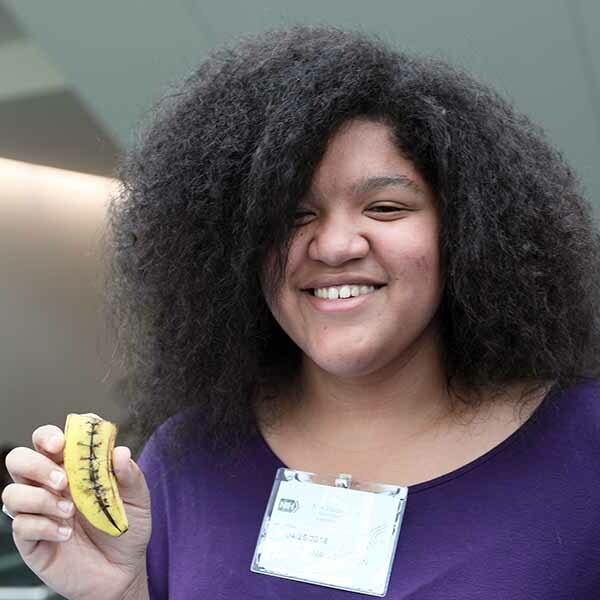 A needle, suturing material, and a little guidance helped this student repair a split banana peel. 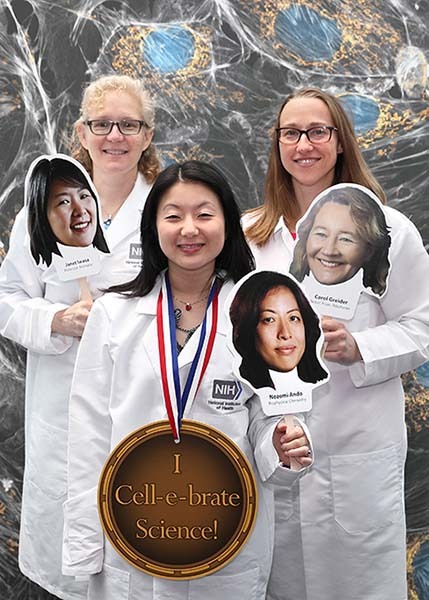 The team from Mentoring in Medicine is jazzed about NIH Science Day. 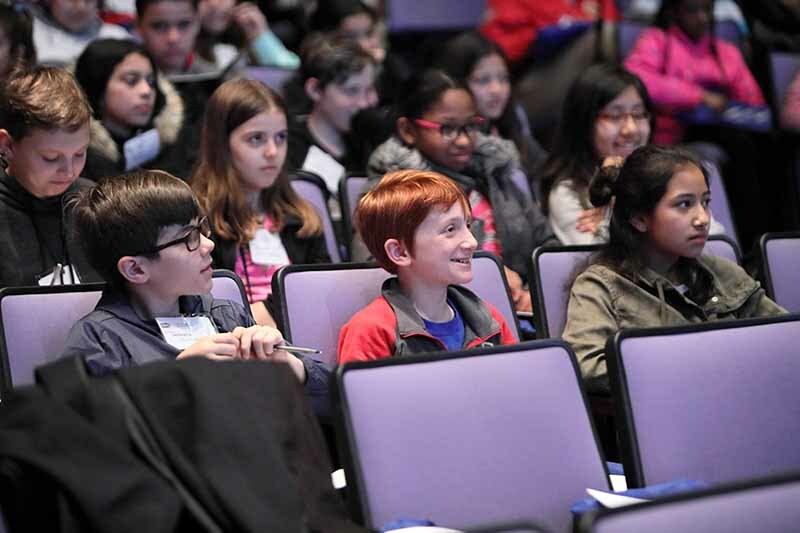 A boy’s smile suggests interest and excitement at this year’s NIH Science Day. Three scientists in the making honor three women who are doing great things in science. Curiosity and questions make for successful science and a successful Science Day.